Note: I just got back from overseas. This is a guest post that somehow got stuck on our WordPress. It is by Nate Sonner who is co-founder of Christian Worldview Discipleship. He and his wife live in Dumaguete City, Philippines. His website can be found here and his Twitter account here. Abortion is arguably the religious and social issue of our day. Since it became legal in the United States, around 56 million children have been killed. To ignore such an issue, as a Christian, would be unfaithful to God who made man in His image. We as believers must be equipped to discuss and offer a defense. Also, the devaluation of human beings in the womb is not a view held in isolation. Many fail to realize that the fundamental beliefs behind modern bioethics don’t merely affect the unborn, but human beings at all stages of life. If these basic assumptions continue on, unchallenged by Christians who stand unapologetically upon God’s Word, we will continue to see the devaluation of all people. The underlying assumption is that people in favor of abortion simply need information, an education. Ignorance is the problem! That’s all. That’s the reason why they abort, because they simply don’t know that it is a baby. These helpless women have been misled, and are blithely skipping along to the abortion mill, unaware of their child within them. Once scientific proof is given that the fetus is a human being, then abortion will be immediately recognized as murder, and abortion will be illegal.2 If they already knew the fetus is a baby, they wouldn’t kill it, because that would obviously be murder. Right? Only criminals would say it’s acceptable, even virtuous, to kill their child. Right? How can we take this sentiment seriously? “If everyone just knew the facts, that the fetus is a human being, then abortion would be illegal immediately.” Really? Who exactly doesn’t know the facts? Who exactly doesn’t know that there’s a human baby in the womb? If you take these kinds of common Christian objections to abortion seriously, you might start believing that nobody has ultrasound technology anymore. Or are extremely forgetful (we’ve been popping out human babies for thousands of years). Everyone who’s opinion matters knows that it’s a baby. The doctors know it’s a baby. Anyone who’s around the ultrasound machine knows it’s a baby. The baby has eyes and ears and fingerprints. The geneticists know it’s a baby (like you need to be one to know that). Everyone knows. You really think that the pregnant woman herself has any doubt about what’s growing inside her? Like she wakes up one morning and seriously believes she has a tumor or something. Really? Like for the first time in thousands of years we are suddenly not sure about what goes on inside a pregnant woman. How many of you aren’t sure that you’re human? Because you came from the womb, and apparently a whole lot of people don’t know what goes on in there. Nobody is confused about what pregnant women give birth to. Human beings reproduce human beings! Do we really think that’s the issue? Nobody is confused about that. The only confused people are the Christian pro-life advocates using these arguments! We’re the ones who are confused in this debate. Many of us actually believe that human beings don’t already know they reproduce human beings. How odd does that sound? Walk up to the person on the street and ask, “Did you know that when a man and a woman love each other very much, they make human babies?” You just might get slapped for asking such an obvious question. Do we really think anybody doesn’t know? Yet, lo and behold, the baby killing business is as profitable as ever. There is a huge disjunction between these claims by Christians and the actual state of affairs. Why then, since the facts are known, is abortion still legal? Obviously, the common Christian approach to abortion are based on bad thinking. Evidently, the evidence and facts are not enough! Case closed! That was supposed to do it. Abortion should be illegal now, since it’s finally admitted that the fetus is in fact a human life. Right? The only defense for abortion was supposed to be that it’s not a child. The case was that the pro-abortion advocate must not know it’s a baby. But, they actually do, since 20 years ago. And abortion is still on demand, during those last 20 years. There was only supposed to be two choices: baby, or matter. We all know it’s a baby. What is the difficulty, then? Evidently, the issue is a bit more complex than the “baby or matter” dilemma. What is the deeper issue? This fine distinction has become a refuge to many who are firmly pro-abortion, yet know full well that a living, human child lives in the womb. What else could be appealed to? To be a modernist with respect to abortion won’t work out: scientifically, it’s a human being. Oops. Time to “leap” to another level. Let’s be postmodern about this, and appeal to some nebulous area ruled by completely arbitrary criteria. Where science fails, it is conveniently abandoned in favor of an arbitrary distinction. Perhaps faithfulness to “science” wasn’t really the issue to begin with, then? In the end, I have to agree that life begins at conception. So yes, abortion is ending that life. But perhaps the fact of life isn’t what is important. It’s whether that life has grown enough to take on human characteristics, to start becoming a person. Take note of the blatant contradiction in the quotation above. Human characteristics, feeling pain, and personality are associated with the baby becoming a human person. To kill a human being is murder. Then she says, “Who are we to say whether the life inside is a person, or not?” Sounds to me like she just did! Human characteristics, feeling pain, personality. My questions is, why do those determine personhood? In principle, couldn’t the criteria be changed? Obviously, the basis is not being genetically human. To put it bluntly, if a Christian objects to a pro-abortionist with the fact that the fetus is a baby, the pro-abortionist may very well say, “So what?” Today, that is not the issue. The question is, how did such a fine distinction come about? In common vernacular, human and person are used interchangeably. Christian pro-lifers will say “it’s a person living in the womb!” (meaning “human child”). Then the pro-abortion advocate responds, “Not yet.” Huh? Our society has put to death its own offspring, millions of them. Our society has justified taking their lives, even claiming it a virtue to do so. It has been said this is a new step in our progress toward a liberated humanity. Materialistic humanism. That’s why. And this worldview is taken for granted and taught throughout every level of Western education, today. This is how people can recognize that the unborn is a child and still be pro-abortion. What is real? Matter. How did we get here? Chance, with lots of time. Based on those premises, those fundamental beliefs, what is a human? Just more matter. No doubt a smarter, more complex, more productive arrangement of molecules; but purely matter, none the less. As the late Christopher Hitchens once said, we are “higher primates.” Humans are at the top of the ladder, but equally void of inherent value or worth. What, then, of the worth of human life? Obviously there are many non-christians that value life. I’ve known several non-christians who were intensely pro-life! To infer that those who are assuming materialistic humanism do not make value claims would be incorrect. They do, for various reasons. The issue is whether they have a sufficient foundation for their value claims. They hold them and in practice they affirm values. But, if materialistic humanists hold that only matter exists, what is the consensus on something immaterial? Science (which is limited to the material) has verified that the unborn are humans. Yet, we see this distinction: it’s not necessarily a “person.” What decides that state of being a “person,” if not science? The criteria for gaining knowledge was supposed to be science! If the material is all that is real, yet people still hold to moral standards, then it follows that there has been a separation between what is material and immaterial, since those standards are not material. Since science can only confirm that a fetus is a human child, what decides that immaterial thing about being a “person”? “With the rise of empiricism, however, religion was reduced to private feelings. Emotional comfort. The concept of truth as a unified, coherent worldview was shattered. It makes sense that if only the material is real, then empiricism (knowledge limited by sense experience) is the only way we can learn what is true. Therefore, truth cannot account for anything beyond the physical! Morals and values cannot be weighed, measured, or examined empirically. So, it follows that religion and morality are not verifiable truths, just personal preferences and emotional expressions. Religion and morality have no connection to empirical facts. This accounts for the current mentality of pro-abortion advocates. Body, biology (fact) is disconnected from personhood (value). Facts are what can be known empirically, and facts are “value-free” or neutral. They carry no meaning or ethical obligations with them. The lower story of facts is objective and universal, while the upper story of values is personal and subjective. Objectivism is the lower story, relativism is the upper story. Ever heard anyone say, “don’t force your scientific facts on me!” No. That defense is only brought up when it comes to morals and religion. Values, ethics, and religion are your thing. Don’t force your personal beliefs on me. In a sense, reality is still dominated by modernism while values are surrendered to postmodernism. Personhood is arbitrary, and therefore there’s no consensus. Since we can’t observe through our senses what or when “personhood” is, it’s left up to experts’ personal criteria (as a result of their anti-Christian presuppositions, which weren’t tested by science either!). Personhood has been completely detached from scientific fact, which means pro-abortionists (who claim to be “scientific”) are enforcing their personal criteria on the issue! Personhood is separated from reality as they see it (empirical fact), leaving it to be tossed to and fro by their personal and unscientific beliefs. How ironic. As we have seen, the real problem is not about mere scientific evidence. It is not about asking the pro-abortionist, “What is the unborn?” according to genetics and biology. That question has been answered (for the last 20 years). It’s a baby. The pro-abortion ethicists admit it’s a baby. The women making appointments at abortion mills know it’s their child. Presenting the evidence, then, is not what needs doing. After all, aren’t both sides looking at the same evidence? If we all know it’s a baby, then why do many still argue that we are able to kill it? Why do children continue to be killed, knowingly? We are all looking at the same evidence. Could it be that people do not “see” evidence the same way? What stands in between facts and people is interpretation. The objective is known subjectively. What is actually there is seen by an interpreter. There are no “brute facts” that exist independent of interpretation (including God’s interpretation). We all interpret the world, the facts around us, according to rock-bottom assumptions. It is naïve to merely present the evidence as if it can be interpreted in a neutral fashion, independent of biases. We all see the evidence, but we also interpret it.The evidence does not mean the same thing to everyone. The key is how evidence is interpreted. Even the fact that a baby is in the womb is not a “brute fact,” but is subject to interpretation according to fundamental criteria. The question is, by what criteria? All of us have criteria. We have basic, fundamental beliefs about reality, knowledge, and conduct. These most basic beliefs, or presuppositions, form the network by which everything is interpreted: a worldview. They determine how we “see” the world. That human child in the womb is interpreted according to an individual’s worldview, along with what should or should not be done with that child. Why doesn’t the unbelieving world “see” correctly, then? Why is their worldview not true to reality as it really is? The bottom line: sin. More specifically, the effects of sin on the mind, also called the “noetic effects of sin” (see Gen. 6:5; Rom. 1:18, 25; 8:6, 20; 12:2; 1 Cor. 1:21; Eph. 4:23, for example). When our first parents rebelled against God, not only were the will and emotions affected, but the mind as well. The whole person, intellect and affections, was turned against God. All of mankind fell in Adam, and now by default suppresses the knowledge of God in unrighteousness: “Their thinking became nonsense, and their senseless minds were darkened. Claiming to be wise, they became fools” (Romans 1:21b-22). Those who remain in Adam live according to “the futility of their thoughts. They are darkened in their understanding, excluded from the life of God, because of the ignorance that is in them and because of the hardness of their hearts” (Ephesians 4:17-18). Unbelievers reject God, the source of truth, and therefore cannot interpret anything truly! As Greg Bahnsen says, “By refusing to submit to the authority of Christ’s Word at the very beginning of his thinking the sinner’s mind is at enmity against God and he is epistemologically incapacitated altogether. . . Fallen man is incapacitated from seeing things as they really are.”13 Because they deny Him, they cannot use their minds correctly, nor know anything truly. This is where the real issue lies. Merely asserting what the unborn is is superficial. That is attempting to kill a weed by cutting the branches and leaves. The only correct, effective way is to attack the roots. The roots of the pro-abortionist is their worldview, their presuppositions. That’s where the problem lies, and it is the worldview that must be dealt with. The “debate” is at that level. The debate is not at the level of “either just matter or a person.” That’s merely the symptom. If Christians on the pro-life side are still engaging in debate with the “matter or person” false dilemma, it may betray their lack of understanding concerning worldviews in general, and particularly the fact/value split currently being assumed throughout Western culture. That is what needs to be addressed. We must expose the materialistic humanist worldview and fact/value split. Spoiler alert: the pro-abortionist may not be conscious of their worldview! It follows then that they will neither be conscious of their inevitable inconsistency. We must bring the pro-abortionist to an awareness, a consciousness, of their underlying fundamental commitment. Then, we must reveal how their anti-Christian worldview cannot sustain itself. This is known as “taking the roof off,” or driving their view to the logical conclusion. Anyone who assumes the fact/value split has no right to make value claims, let alone truth claims. They have no right to make value claims, because they only grant materialism. They have no right to claim any truth whatsoever, because they deny God who is the source of truth. After exposing the worldview of the pro-abortionist, and finding it lacking by way of internal critique, we then offer them to come and see reality from the Christian worldview, the point of view of Scripture. We show that the Christian Worldview provides the answer, not merely the best answer, but the only answer. Christianity is the only valid worldview. There is no possibility for it to be otherwise. It is nonsensical to think that retaining their materialistic worldview will lead to change. It was the corrupt foundations that led to this situation, and it does not have the stability to fix it. Also, it disagrees with reality as God created it. Any anti-Christian worldview, by definition, denies Him altogether. Naturally then, it is neither right nor effective to share non-christian ground with the unbeliever in handling this issue. It is their worldview, their foundation, that results in their position. It would be foolish to think they will change while continuing to stand on it. Any change in conviction necessitates a change in their basic commitments. We cannot stand on their ground, we must remain firmly planted on the only correct worldview. The Christian worldview accounts for all reality. There is no split. The Bible (and therefore, God) presents truth as a whole, there’s no splitting between facts and values; Biblical truth accounts for both. The Bible shows reality to not only be material, but also immaterial. God created all of reality. God gave us His Word, which correctly interprets reality. God is the source of both, and therefore the two correspond to each other. Scripture says reality is not only material, but also immaterial. Scripture presents a worldview that is unified and coherent. If we set aside our Christian bias (which is the right bias), and basis, what exactly would we have by which to justify the inherent value of the unborn? God gave that value, which only makes sense within the entirety of His revelation in Scripture. God-given value of the human being does not make sense in a God-free worldview. What Scripture declares about people does not fit in a worldview that denies Scripture. If we set aside our Christian ground, we have nothing. We’ll be building on sand, with the unbeliever. Such would not be faithful, for all of life (including our way of thinking and methods) must submit to the Lordship of Christ. Even the tools God has given us, such as reason and logic, have no foundation apart from God’s revelation. To attempt to use these gifts, while setting aside the Giver, is wrong. Do we not share them in common with the unbeliever? Yes, because they know God (Romans 1:21), are made in God’s image, and live in His world, despite their denial of Him. But, they use them without basis, nor for God’s glory. They attempt to use these gifts, while setting aside the Giver. They suppress their knowledge of God, and deny their being made in His image, and use His gives in rebellion. That is the mindset of unbelief, independent of God’s authority, which is autonomy. The tools we have are not a foundation unto themselves, but are upheld by God and dependent upon the total drama of Scripture. They only make sense from within the Christian worldview. They are not isolated, but interdependent within the larger framework. “Unlike the evolutionary concept of an impersonal beginning plus time plus chance, the Bible gives an account of man’s origin as a finite person made in God’s image, that is, like God. We see then how man can have personality and dignity and value. Our uniqueness is guaranteed, something which is impossible in the materialistic system. If there is no qualitative distinction between man and other organic life (animals or plants), why should we feel greater concern over the death of a human being than over the death of a laboratory rat? Is man in the end any higher? Again, only the Christian worldview can provide the adequate basis for protecting the life of the unborn. Only from the Christian worldview as a whole can we approach this issue. The inherent worth of the human child is not an isolated belief. It is interdependent on fundamental criteria found in Scripture alone. The pro-abortionist’s denial of the child’s worth is not an isolated belief, but arises from their anti-Christian presuppositions. Because this is the case, we must oppose their entire worldview with the worldview provided by Scripture. We cannot argue for a Scriptural result from un-Scriptural grounds. We must remain committed to God’s revelation. In essence, we are combating their unbelief with the teaching of Scripture, itself. We are confronting their suppression of their knowledge of God and their own “createdness” in His image with the powerful, infallible, and effective Word of God. Their convictions will not align with Scripture if they remain standing on their unbelieving foundation. They must leave their anti-Christian commitments and unconditionally surrender to God’s authority. “In the flood of the loss of humanness in our age—including the flow from abortion-on-demand to infanticide and on to euthanasia—the only thing that can stem this tide is the certainty of the absolute uniqueness and value of people. And the only thing which gives us this is the knowledge that people are made in the image of God. We have no other final protection. And the only way we know that people are made in the image of God is through the Bible and the Incarnation of Christ, which we know from the Bible. To say “it’s a person, human, or alive” is meaningless to the materialistic humanist. The issue of value, human life value, what makes it different, is a worldview question. “It’s alive!” “Ok, so is the cockroach.” It is merely a different arrangement of matter. Any value given is ungrounded and detached from the “fact” level, and therefore variable without consensus. That’s where the “personhood” debate is. Because of the Fact/Value Split, personhood can’t be agreed upon, because it has no connection to fact—publicly verifiable truth (according to scientific method). To say it’s alive and human is meaningless. Why should it be treated any differently? Why should there be something higher than my preference when deciding it’s value and what to do with it? Only the Christian worldview can answer. God’s Word says that reality, this universe, is not the result of impersonal matter in motion. The universe is created by the personal God, and is not just matter. God’s Word says that Mankind is not the same as the rest of Creation, but that Man is made in the image of God. Humans have value because God made humans in His image (Genesis 1:26-30, 2:7, 5:1-3, 9:5-6, James 3:9. ), it is derived value. That is where “personhood” actually comes from (but not as a separate issue from biology). Biblically, to be human necessarily means to be a person. The personal God made Man (persons) in His Image. Hence, in the covenant with Noah, “Whoever sheds man’s blood, his blood will be shed by man, for God made man in His image.” Genesis 9:6 [emphasis mine]. That is the firm foundation for valuing and protecting human life, including the unborn. No other criteria exists. 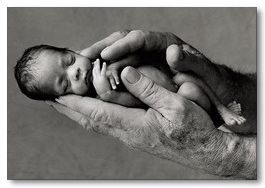 Therefore, it is inadequate, and I think naïve, to simply prove that the unborn are alive and human. We must go deeper. It’s not the stems and leaves of weeds that we attack, but their roots. An attack at the worldview level is mandated. Hence, a Worldview Apologetic, or Presuppositional Apologetic. We stand firmly on the presupposition of God’s Word, as the only answer and basis, and we expose the opposing worldview, reducing it to absurdity by internal critique. Only the Bible provides the answer: Are human beings always valuable persons, regardless of life-stage? Yes, because the personal God made Man in His image. Only based on that can there be protection for the unborn. And if the opposition denies it, we “take the roof off” of their assertions. We let reality cave in on them and, for the sake of argument, drive them to the logical, hopeless conclusion of their unbelieving worldview. “But when we accept Christ as Savior, we must also acknowledge and then act upon the fact that if He is our Savior, He is also our Lord in all of life. He is Lord not just in religious things and not just in cultural things such as art and music, but in our intellectual lives and in business and our attitude toward the devaluation of people’s humanness in our culture. Acknowledging Christ’s Lordship and placing ourselves under what is taught in the whole Bible includes thinking and acting as citizens in relation to our government and its laws. We must know what those laws are and act responsibly to help to change them if they do not square with the Bible’s concepts of justice and humanness. The biblical answers have to be lived and not just thought. Sproul, R.C., Abortion: A Rational Look at An Emotional Issue (p. 7). Kindle Edition. Schaeffer, Francis A., Whatever Happened to the Human Race? p. 353-354 (1979), in The Complete Works of Francis A. Schaeffer: A Christian Worldview, Volume Five, A Christian View of the West, copyright 1982. Pearcey, Nancy (2010-09-01). Saving Leonardo: A Call to Resist the Secular Assault on Mind, Morals, and Meaning (p. 24). B&H Publishing. Kindle Edition. Greg Bahnsen. Presuppositional Apologetics (Kindle Locations 1370-1372, 1373-1374). American Vision. Schaeffer, Francis A., Whatever Happened to the Human Race? p. 356 (1979), in The Complete Works of Francis A. Schaeffer: A Christian Worldview, Volume Five, A Christian View of the West, copyright 1982. A good explanation of the worldview approach to the issue of abortion, IMO. I would also offer that our ‘worldview’ about this and other issues is directly related to our idea of God. That applies both to the God denier as well as the Christian. The God denier vehemently denies the One he knows exists because he hates the very creator who grants him the ability to mount an argument. Is that a bit ironic? It is quite ironic indeed! We must point out the tension that you noted. Loved the piece, every well thought out! You’re welcome! Thank you for writing this! I think that at least some of the debate over abortion is, in fact, over the facts. People blindly ignore them or say that pro-life advocates are lying when it comes to the facts about the unborn. Of course they agree that we were once unborn, but many, many people I have talked to literally on the street about abortion still don’t have the facts right. And, I’ve found, when you convince them of the facts, all those but the really hardline folks will at least reconsider their position. So I’m not sure I completely agree with the notion that informing others about facts or the standard strategy of showing the unborn is a human person is a failure. Moreover, the issue of personhood is indeed vastly important in the debate over abortion, which is why we need to get people settled on the facts so we can move to the next step. None of this is to say that worldview isn’t an issue. I do believe facts are important but we must always remember to consider the facts that shape other facts, particularly those that shape how evidences are evaluated, etc. Thanks for reading this guest post J.W.! Reblogged this on OneDaring Jew. This is an extremely long post, and I admit to not having read it through entirely. I just wanted to share a perception that I have developed through my sympathetic engagement with pregnant women, and it reflects your statement that we must cast off the “materialist world-view.” In my experience, life begins when a soul enters the womb. Only a mother knows when that happens. It doesn’t always happen at conception, but when a demonic spirit enters a woman through violence, it rapes her from the inside out. I recognize an abortion as a terrible outcome of a process that should be about celebrating the opportunity to create a context in which the soul we are entrusted with can grow into greater expression of God’s undying love for the world. However, I would prefer that celebration of the beauty and grace of that experience be at the forefront of the enculturation that leads young men and women into behaviors that prevent unwanted pregnancy, rather than fear of the power of the state. As Jesus taught us, there is no law but love, and ultimately it will be the regulation of the Father’s wisdom that must guide humanity, not the regulation of the state. Lest we forget, it was God’s choice to preserve Cain, and the regulations of the state that put the savior on the cross.